Mohammad is a passionate humanitarian and a charismatic and inspiring young man. 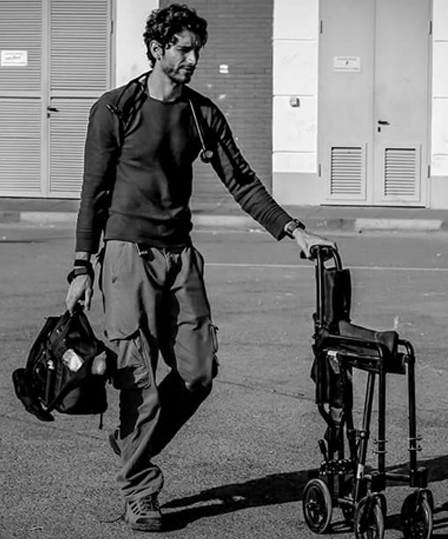 He left his home, family and friends and went to Greece, to Idomeni, to lend a hand in the tragic refugee crisis. He realized he could no longer watch events unfold without doing something about it. 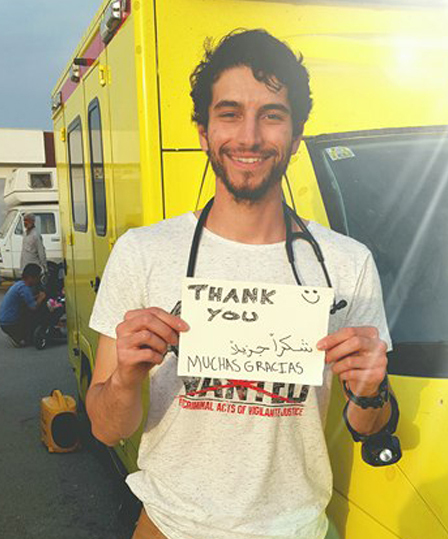 He is now with the Syrian people, in a refugee camp and he runs a health clinic from two ambulances together with other volunteers, in Eko camp, 20 kilometers from the Macedonian border. Rania Hammad met Mohammad on 29 April 2016 to talk about his involvement in helping the Syrian refugees in Greece, both on the ground and by fund raising for them. Their interview follows. Why did you decide to go to Greece to help the Syrian refugees? A certain story shocked me. One day I was translating from Arabic into English for an Egyptian family at the hospital where I worked. The woman was holding her small child in her arms, and she was in tears. The couple had already lost three children. We asked them why, and wondered if their children had had some genetic disease, but it turned out the children had died because they did not have money or insurance and could not afford doctors; for that they lost their children. This horrified me. The fact that being unable to pay basic healthcare could cost them their lives. So I felt the need to do something, immediately. I could no longer sit there at home, in my city, knowing that these things were happening. I felt ashamed and guilty. The most urgent crisis was the one regarding refugees in Greece, so I decided I had to go to the refugee camps and help run a clinic, for the public health of the people arriving from Syria. 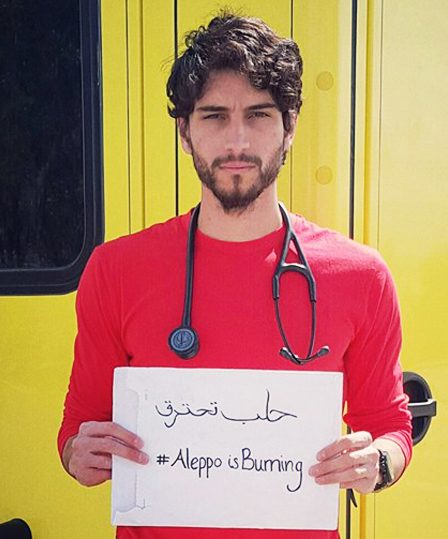 I would have gone to help anyone: Syrians, Afghans, Palestinians, any human being in need. You are there because you want to make a difference in their life, in their day-to- day lives. These are my people, and I was starting to feel very guilty about being at home and doing nothing about it. 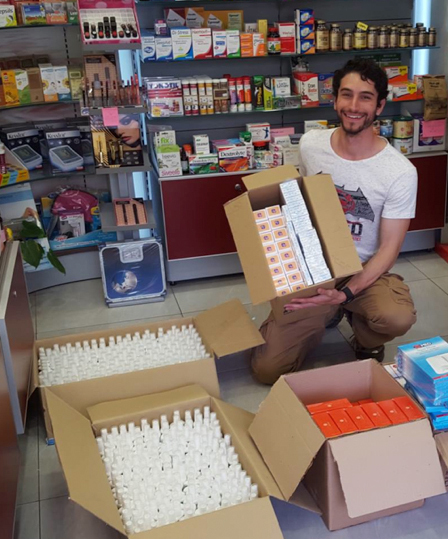 When I came to Greece to help the refugees, it was to help run the clinic and take care of medical emergencies, but I soon realized that the refugees needed all sorts of things, and these needs came up on a daily basis. For example, I felt that we needed to get them nutritious food, in addition to the food they were being given at the camp. We wanted them to feel human again. We buy them chicken and potatoes, because they eat the same porridge every day for lunch and dinner, and oftentimes it can be spoiled. The refugees do not complain, but sometimes they say they cannot take it anymore. I want to give them a bit of hope and I want them to smile. I want to make a difference, even if it is just for one day. How did your family and friends react to your decision to leave for Greece to help the refugees? When I told my parents what I wanted to do, there wasn’t a doubt in their mind about what I should do. They supported me fully and they said it was about time. My parents are very wise, they said yes go, and we'll see you when you get back. My friends thought I was crazy to leave a good job and salary, but have been very supportive ever since. They asked me to post pictures and videos, and then proposed to send donations. A lot of the donations come from my friends and their friends, and the word has spread via social media and Facebook. My friends are now asking me how they can make the move as well, and I tell them ‘just come man, just come’. I was supposed to stay for one month, but after day one I extended it for another month and now I have decided that I will stay as long as I possibly can, which is until the summer when I will need to get back to school. It is a sacrifice. I left my family and friends, and I am still paying rent for my flat in California, but this is my choice since I want to be here. I bought my own ticket and I am renting a room here, so I am spending whatever money I have. I am also teaching English in the refugee camp. Seeing people come to class from all over the camp and from other camps, reminds me that it is worthwhile and I would never go back. This is where I want to be. What is your day like? What do you do? In the bigger camp - Idomeni - there are 11,000 - 14,000 people. Eko camp is 20km away from the border with Macedonia, and there are around 3,000 people. This is where we operate. It used to be a gas station, but now it’s a refugee camp. I work with a midwife and she takes care of a lot of the pregnant women, and I help her translate. There are around 600 pregnant women in Idomeni, and 40 to 70 in Eko, many of them did not think they would be here for so long. They did not think the border would be closed for so many months. We take them to the hospital when they have to deliver, and then they come back to the refugee camp with their newborn babies. The older kids, on the other hand, have been out of school for a long time. When I started to share the videos of life inside the refugee camp, I started to receive a lot of funding because it is when people see these things that they understand the reality on the ground. Who has been funding you, and what have you been purchasing for the refugees? Many of you are doing outstanding work – is there anyone in particular you would like to acknowledge? There are many volunteers, and they come from many different countries. They are extraordinary people, and doing an incredible job. Our team in particular is amazing, and there are too many to mention. Most of them are Spanish and German, but there are several Americans and Swiss. Many are nurses like me that come from an emergency background, and as I said there are emergencies that happen. During the day we buy things for people and in the afternoon we are in the clinic and we do our medical duties. There is always lots to do, and new things come up everyday. I work with a great guy of Greek decent, called Petros. I love this guy. He is a shaker and a fixer, he gets things done. One day he said ‘we will get them pots to cook’, and so he shows up later on with huge boxes with pots and pans to distribute throughout the camp. He was in Lesbos and he helped people off the ship, literally getting people safe to shore, in their thousands. Jeanna is another amazing volunteer. She is an American midwife and she takes care of the women; she checks on them and makes sure they are well. Thor is a nurse and Mairi and Nathan are co-ordinators that help me run the clinic. We set it up and get it ready for the doctor and nurse to do their checkups. A number of individuals come together as volunteers. We cover overnight, and everybody knows that we are the emergency tent at Eko camp. There is a Palestinian woman that teaches the kids in a big tent set up to be the school. There are volunteers that teach the refugees, old and young, and they truly make this camp work. A British volunteer is a cook, and he cooks for 5,000 refugees every day. 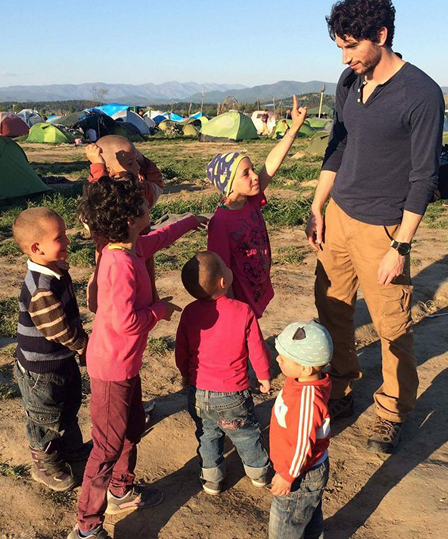 His organization is called Hot Food Idomeni. He is incredible. I also want to praise our Syrian interpreters: Hassan, who was shot twice in the back, and Abdallah for being supportive and helping out even when they too need a break from this all. What are the refugees’ most urgent needs? Basic public health. However, specific needs change: last week it was bug repellant that was most needed. There were so many people getting mosquito bites that it became a medical issue we had to deal with. So I went out to buy 350 mosquito repellants and gave one to each tent. Then cool weather came, so they will not be using the repellent right now. This is what I mean when I say that we take care of them day by day, and the needs change day by day. We now decided we need to get caps for the kids so they do not get sunburned, as they are outside playing all day. They do not just sit in the tents, as you may imagine. And we have sunscreen. The kids are malnourished and our priority now is to get them vitamin supplements. Even if they were to leave here soon, I will give each family the vitamins for their children. We need to prevent medical problems as well. Nothing is better than prevention. There are also other sorts of medical emergencies. For example, many women have panic attacks that look like seizures. We have to assess ABC'S and vitals first. After that, a focused assessment followed by a head to toe assessment. Many times, they have mimicked seizure like activity. Upon further investigation of the history from family and friends, our medical team has come to a conclusion that many of the women in the camp site suffer from severe PTSD secondary to their past experiences with the war in Syria. It's very sad to see. Mental health workers are urgently needed and social workers. There is a 17 year old who lost 8 people from his family, and we have done everything possible to make this child feel ok again; but understandably he will not smile, no matter what. They vent, they tell me ‘when will anyone do something for us? When will they listen to us?’ When the United Nations personnel come and I have to translate to the refugees, they get so upset and frustrated as they are being told to be patient. I get pulled in to translate all the time, and it is not easy, as I feel I want to say something to them. I empathize with their suffering. I tell them I understand their frustration. And explain to them that it is hard for me too. Going back to the USA after having witnessed these things will not be easy. But I am here, I gave up a job and I gave up my life. If I could carry you on my back and take you, I would. What event moved you the most? A family. I have a picture with them. They have nothing. The mother is sick and she has cancer. They make bread for everybody. They charge only 1 euro for 4 big round Arabic flatbreads, which they keep cheap and affordable for the others. They will always give me something when I visit them in their tent. They are generous and hospitable. They invite you into their tents to have coffee and tea. This family will insist on giving me warm freshly baked bread, and this has touched me immensely. It is always the people who have nothing who will give you everything. I have to wait and see. They might be moved to a military camp and the volunteers would not be able to go into these military camps. Idomeni was supposed to be shut down weeks ago, but how would that even be possible when there are 11,000 to 14,000 refugees? The Greeks are very receptive and they sympathize with the plight of the refugees. I will stay here for now because if you see the kids, you smell the campfire, and you talk to the people, you can really understand. I thought that the picture of the Syrian boy that washed up on shore would really shock and impact people and that they would finally understand. You know, one picture that would shake the world, like the famous picture of the young girl in Vietnam, naked and running as her skin falls off. But I have to say it is incredible how quickly the image of that Syrian boy was forgotten. I told myself that I was not going to post pictures of the children at the refugee camp, but I have to post them. I hope they will shed some light on the Syrian refugee crisis situation in Greece. Pictures can tell a thousand words. The men, you can tell that they feel a sense of sadness, and a sense of lost hope. Lost hope that they won't be able to provide for their families as they once used to. Lost hope that their kids won't get the education they deserve. The women and mothers, you can see and feel a sense of strength. They know they need to be strong to hold the family together. They stand tall despite the struggles. The kids have the most beautiful smiles that I have ever seen. They radiate energy and hope throughout the camp. You are truly an inspiration to us all. For being there, for caring, for sharing these stories and for giving them hope and doing as you say, being a difference in their lives, even if it is for just one day.